When it comes to internal sliding door repairs, there are some options you need to take into account. Our service for internal sliding door repairs captures all the different types of doors that are needed. You see, the one common element with all internal sliding doors is the rollers and the tracks they run on. Most of the common internal sliding door repairs are the ones that slide across from one room to the other so they have a straightforward track at the top and they have a gliding track down the bottom. What you’ll find is some of these, the tracks have come loose or maybe have been broken. Also, the critical factor is the roller. 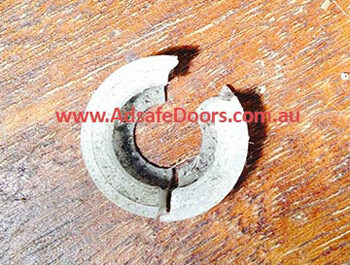 The sliding door rollers that are contained within the sliding door are very important. They’re the ones that are helping it roll smoothly, or they’re the ones that are making that grating noise or that annoying noise you can’t seem to get rid of. Why did I wait so long for my internal sliding door to get fixed? 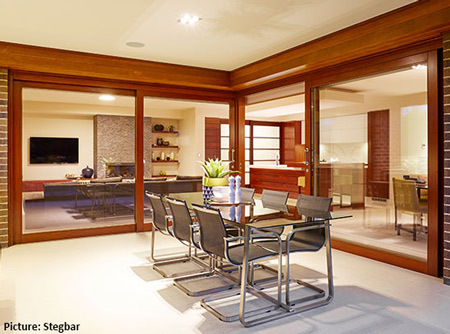 So no matter if you’ve got a double internal sliding door, often we find from lounge room to the kitchen there’s a big internal sliding door or even the bifold, the ones that fold in. They all contain a track, and they need to be guided along the top section. You’ll also find down the bottom that they’ll have a guiding track as well. You will notice how heavy the wooden internal sliding doors are, and as a result, they do put a lot of wear and tear on the bottom track area. So we’ll ask you a couple of critical questions when you phone up to ask for a free quote on your internal sliding door. We’ll ask about the type of door, how heavy the door is, and what components are in there and what sort of noise it’s making. That way we can make a qualified decision as to the type of repair that needs to be done. Stegbar is one of the most common internal doors we fix. They are a huge brand and are in a lot of homes. Stegbar was founded in 1946 by Brian Stegley and George Barrow and have been a market leader for decades. Click play on the video below to see a before and after on fixing a Stegbar sliding door. Internal glass sliding doors are by far the most popular as they open up your space completely. They help make your home look bright, fresh and modern. Aluminium internal doors have been the main door type in Australia for decades. They come in a few different colours and the aluminium part refers to the frame. Each aluminium door is actually a glass door but people sometimes refer to them as aluminium. For those who love to use their space efficiently, internal glass cavity doors are amazing. These are ultra modern and efficient as the door retracts into the wall. Therefore you do not need the space to open and close your door. Wooden doors have a wonderful aesthetic feel to them. They can be large or double wooden doors and always look fantastic. The trick with internal wooden door repairs is the weight of the door and making sure you have the right equipment to handle that weight. Quality rollers and tracks are essential here. People love to go for the double sliding doors as if you use glass, it can really open up your space. If you love the open plan look in your home, double glass doors are excellent. Most modern homes have an exit to the back entertaining area and they love to use large internal sliding doors. These are usually always glass. These are heavy and require a professional for all door repairs. Don’t risk trying to fix these on your own. The basic cavity door for all homes. I bet every homeowner would want these if they knew how convenient they are and how much space they save in a home. You can use the full extent of the room with these. All the most modern internal doors are either large double glass internal doors or internal cavity doors. We love fixing these as the homeowners are always happy with the choice of their door. 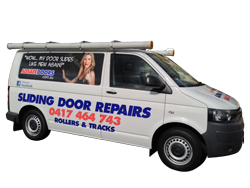 We service the whole Sydney area, so you’re welcome to give our team a call, and we’ll be able to handle your internal sliding door repairs. Our offices are open seven days a week so feel free to call at any time during business hours. We look forward to looking after your internal sliding door repairs.